When the joystick key is pressed down, the main menu appears, which consists of nine icons that lead to sub-menus. The first icon is for the phone book. Here, you can find the call contacts, ways to add contacts, manage contacts, set personal pictures and rings for each contact, as well as set up "Voice Command." There's also some advanced options like "Copy from SIM," but I won't get into those. 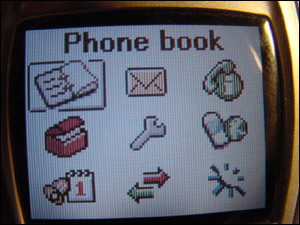 The coolest thing about the phone book menu would have to be the personal rings and pictures section. Like a lot of phones, you can set it to use a certain ring/picture when a person in your address book calls. Since I also received the MCA-20 camera from Sony Ericsson, I could take a picture of someone in my address book, and set it so that whenever that person calls, his/her picture shows up. It's very cool and awesome for showing off. Everything else in this section is fairly straightforward. I'll talk about "Voice Command" later. Next up is the messages section. Here, you can find ways to contact people via SMS, MMS, E-mail, and chat. One nice thing about this phone is the fact that it supports MMS, which is a message you can send to another person that has graphics and color in it. Unfortunately, if you want to send it to someone, they need to have a phone that supports MMS. MMS is much like a SMS message, but with a little "spice." SMS is fairly standard, and there's nothing too exciting there. If you have an account for internet with your cell phone provider, you can send e-mail to people right from your cell phone, as well as check multiple mailboxes. I use this feature a lot to catch up on any e-mails I get when I am away from my computer. Unfortunately, you can't check multiple e-mail accounts at once. You'll need to switch to that account in a different menu. I haven't tried doing the "Chat" feature, but what it is is a way to join more then one new-generation Sony Ericsson phones in a live chat, like Instant Messaging. You can also set up your voicemail here, as well as call your voicemail. Next up is "Calls." In this menu, you'll find the missed calls list, as well as the incoming/outgoing calls list. You can also set up call forwarding and call waiting, as well as call priority here. You can view call and data counters here too, as well as set-up your caller ID feature for the next call. Nothing too exciting here. You'll find here an easy way to change the overall look of your cell phone. Sony Ericsson includes five of them, which are the four seasons, as well as a Sony Ericsson style one. I use the seasons themes a lot because they make the phone look great. Here, you can view any pictures you have on your phone, as well as any taken by the Communicam add-on camera. You can set any picture here as your background or screensaver, as well as send it to people via infrared, Bluetooth, MMS, or e-mail. You can also set a picture for a person in your contact list very quickly here. Sony Ericsson provided me with 13 included pictures of random things, but since it is a loaner phone, some may have been deleted in previous times. I know my T300 came with 40+ pictures included. Next up is the Draw Picture section. It's fairly self-explanatory. Sort of hard to do, and sort of pointless, but it's fun to have. You can send any drawing you make via infrared, Bluetooth, MMS, or e-mail. Here, you can listen to any sound that's on your phone. It's hard to believe that the T68i doesn't have polyphonic ringtones, considering that the lower model, the T300 does. The ringtones that are included are very annoying. If you have some way to connect your phone to your PC (I'll get into how to do that later), I strongly recommend getting more ringtones. Here, you can compose your own music to be used as a ringtone for your T68i. It's pretty cool, but I've never made anything that I would actually use. Ah yes, the best part of any phone is games. However, I was disappointed at the games on the T68i. Although there are eight of them, I really only enjoy two. The games included are Arimona (Free Cell), Contrary, Erix, Four Piles, Naval Fleet (battleship), North Territory, Q, and Yukon Struggle. I ended up mostly planning Erix and Naval Fleet and ignoring all the rest. Many of the games support a multiplayer more, in which you can play with other people that own a T68 via Bluetooth or infrared. Very cool! 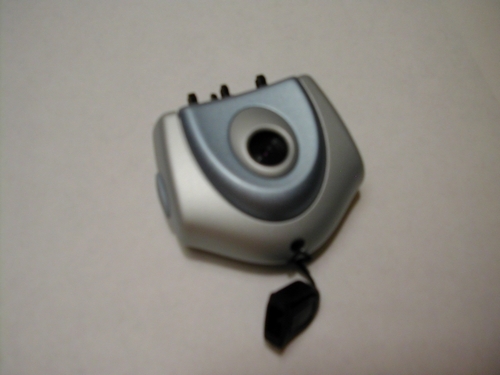 Sony Ericsson also sent me the Communicam optional camera attachment to review. Although I liked the idea of having a camera on a cell phone, but I wasn't too impressed with the MCA-20 camera attachment. The camera is small and sleek, and looks awesome. However, "in action," the camera fails to impress. The quality on the phone's 256-color screen makes the images look horrible, no matter what the light is like. The picture is pretty much black when taken in low-light situations, and when in bright light, quality is still bad, and looks pixilated. There are four different resolutions, 640x480, 320x240, 160x120, and 80x60. The camera only holds 14 images of the highest resolution, and 208 pictures at the lowest quality. After playing with the camera, I found that 320x240 was the best resolution. The images are stored on the camera memory, meaning that any picture taken is not stored on the phone, but on the camera. If you want to use any picture on the phone as a background or phonebook picture, you'll need to transfer it to the phone. You can change the white balance and contrast on the camera settings, but I didn't find a noticeable difference in image quality. The coolest feature of the CommuniCam is probably the fact that you can take a picture of a person, and set up the phone book so that whenever that person calls, their picture shows up. However, like what I said above, the quality is so bad on the phone because of the color screen, this feature is somewhat pointless because of the horrible quality. Unfortunatly, Sony Ericsson could not send me a USB data cable to use to connect the phone to my computer and see what the images looked like on a good screen. But, I've seen other people's results when the camera is connected, and it looks decent for a camera that is designed for a cell phone. Overall, I can't say I was impressed with the MCA-20 camera. Luckily, now the standard of cameras is MCA-25. I haven't had a chance to try that camera out, but hopefully it's better. This isn't to mention the fact that this camera is about $170, but can be found for around $100 on eBay. Here, you will find various settings for your cell phone, including sounds and alerts, display, language, time/date, voice control, locks, profiles, handsfree, and master reset. I'll go through each one. Here, you can change the ring signal, volume, vibration, alarms, message alert, minute minder, and key sounds. Fairly straightforward. Profiles are useful if you like to customize your phone a lot. If you use Windows XP or a graphical version of Linux, you should be fairly familiar with this. Basically, your profile contains all your configurations, like your background and ringtone. If you change to a different profile, everything is changed to that profile. You can change back and forth easily, making it great if you customize your phone a lot. Here, you can set up user greetings, backgrounds, screen savers, text size, light, contrast, and master reset. Everything is self-explanatory, so I won't go into them in detail. This phone supports US English, French, as well as Spanish. The text input can be done manually or with the T9 feature, which is very convenient. Basically, T9 is a dictionary on the phone that allows you to only have to press the key once when typing, even if the letter you need would normally have to be pressed three, or even four times. When you type, it automatically looks for words that would be possible with those key strokes. Unfortunately, there is no satellite time/date on this phone, so you can enter it manually here. It does change time zones and daylight savings time automatically, however. One thing I loved about this phone was Voice Control. No longer do you need to have hands to dial, and if you have a Bluetooth headset, it makes the phone truly handsfree. The feature worked perfectly. Once you have the phone all set up for voice control, it is extremely easy to use, and I had no problems with it. Luckily, this phone has an automatic key lock, which locks the keys automatically after around 20 seconds, so buttons are not accidentally pressed. I strongly recommend activating this feature, for when I did not have it activated, I called many people in my address book my accident. You can also add SIM locks and phone locks here for security. You can set up answering mode and hands free type here. There are two options here. You can either just reset settings, or you can reset everything, which erases your contact, and anything downloaded or added to the phone. Here, you can access the mobile internet, as long as you have it set up through your cell phone carrier. It usually costs extra a month, but in my opinion, it is worth it. Not only is it easy to use, but everything's in color, so it's so much cooler. You can check up on news, stocks, weather, movie times, everything! So convenient, and its very easy to use. You can also enter a URL manually here, as well as load up bookmarks saved. This is the section where the Sony Ericsson T68i really shines. Not only does it offer Infrared, but it offers Bluetooth. In case you don't know what Bluetooth is, read on. Bluetooth is a technology that allows you to wirelessly connect something to another thing, usually with a distance of 10-50 meters. In the T68i's case, you can connect it to PDA's and Computers, letting you use the cell phone modem as a computer/PDA modem, as well as downloading new content to the phone and syncing Microsoft Outlook with the phone. Unfortunately, most computer's don't have Bluetooth when bought, and add-on cards are fairly expensive. A USB adapter costs around $50, which is a lot of money just to connect your cell phone to your PC. Since I don't have Bluetooth on my computer, I was unable to test this feature. But, continue reading to learn about my experience with Sony Ericsson's HBH-30 headset. In case you don't have Bluetooth, and want a cheaper way to sync your cell phone to your computer/PDA, you can always go with IR. Almost every PDA has built in IR, and an USB IR adapter can cost as little as $15, so it isn't a big break on the bank. It offers the same features as Bluetooth, but the phone needs to be much closer to the receiver, appx. max 2-3 feet. It is also slower then Bluetooth, but it serves the same purpose. Once again, I don't have Infrared on my computer, so I was unable to test this feature. Also in the Connect section, you'll find the GSM Network setting, and Data communications settings. If you don't like digging through menus on the phone to find what you want, the My Shortcuts menu is perfect for you. It lets you choose the shortcuts you want for things you use the most. Instead of having to dig through menus for it, you can just go to the My Shortcuts icon and select it in the list of shortcuts. However, although it's a great idea, I never really used it.